In the context of machining, a cutting tool or cutter is any tool that is used to remove material from the work piece by means of shear deformation. Cutting may be accomplished by single-point or multipoint tools. Single-point tools are used in turning, shaping, planing and similar operations, and remove material by means of one cutting edge. Milling and drilling tools are often multipoint tools. Grinding tools are also multipoint tools. Each grain of abrasive functions as a microscopic single-point cutting edge (although of high negative rake angle), and shears a tiny chip. Cutting tool materials must be harder than the material which is to be cut, and the tool must be able to withstand the heat generated in the metal-cutting process. Also, the tool must have a specific geometry, with clearance angles designed so that the cutting edge can contact the workpiece without the rest of the tool dragging on the workpiece surface. The angle of the cutting face is also important, as is the flute width, number of flutes or teeth, and margin size. In order to have a long working life, all of the above must be optimized, plus the speeds and feeds at which the tool is run. Cutting tools are often designed with inserts or replaceable tips (tipped tools). In these, the cutting edge consists of a separate piece of material, either brazed, welded or clamped on to the tool body. Common materials for tips include cemented carbide, polycrystalline diamond, and cubic boron nitride. Tools using inserts include milling cutters (endmills, fly cutters), tool bits, and saw blades. The detailed instruction how to combine the tool assembly out of basic holder, tool and insert can be stored in a tool management solution. form of the cutting edge: radius or waterfall or trumpet. cutting edge ellipse axis for asymmetric edges. 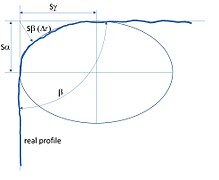 factor K, this is the relation between Sγ and Sα. This can also be calculated by the ratio of the two axis of the ellipse. This factor describes the form of the cutting edge. One of the most important cutting edge parameters is the K factor. It specify the form of the cutting edge. 1 means a symmetric cutting edge. If the value is smaller the form is called a waterfall. If the value is larger than 1 it is called a trompete. Depending on the cutting material, feed rate and other influence factors a cutting tool with the optimum K factor should be used. ^ Stephenson, David A.; Agapiou, John S. (1997), Metal cutting theory and practice, Marcel Dekker, p. 164, ISBN 978-0-8247-9579-5. This page was last edited on 27 March 2019, at 11:03 (UTC).